Leisure travel remains a vital piece of the United States economy, with domestic travelers spending $880 billion in 2017. Travel supports job creation like no other industry in the U.S., and destinations around the world depend on American tourists to support their economy. With Americans having so much influence on the global travel market, understanding this diverse group of travelers is essential to maximizing profits. While it is impossible to summarize a country as large and complex as the United States with a few statistical trends, the past year has revealed some notable findings that can help hospitality professionals better understand this key market. 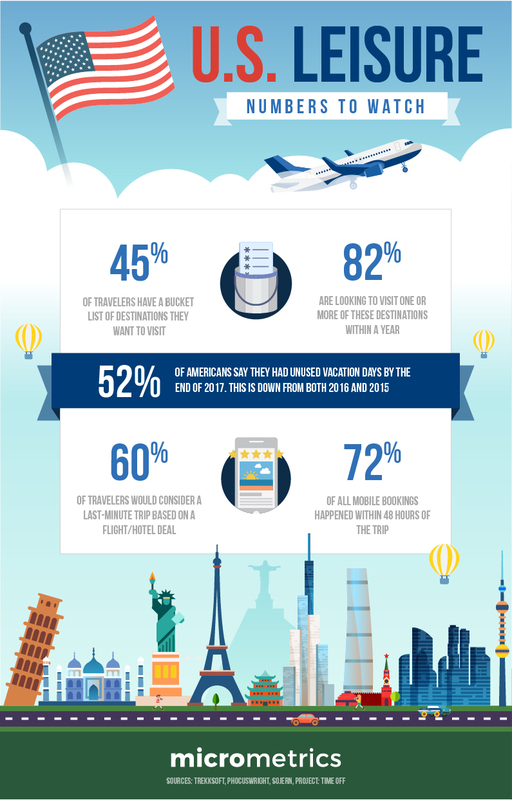 45% of travelers say they have a bucket list of destinations they want to visit in their lifetime, and 82% are planning on traveling to at least one of these places this year. This means that travelers feel a sense of urgency when it comes to once-in-a-lifetime travel experiences. One way travelers are satisfying their wanderlust is by booking cruises, as a recent study shows that the spike in cruise bookings is in large part due to bucket lists. Cruises are a convenient way to experience multiple destinations, giving travelers time to relax in between port visits. Cruises are also rising in popularity among millennials. This goes against the assumptions many people make about cruises being filled with retired folks, and cruise lines are even adapting to satisfy the interests of millennial leisure travelers. Not only are travelers of all ages prioritizing memorable experiences, but there is also a general willingness to take risks while traveling. The AARP has found that boomers are likely to plan a trip that focuses on bucket list destinations. However, other studies have shown that the desire to seek out the unconventional and cross off bucket list items is highest among millennials, as 83% say that taking risks and visiting unique destinations is important to them. This may come as a surprise since younger travelers presumably have more time to cross items off their list than their elder counterparts. However, this trend further supports the idea that meeting travel goals is an urgent need for many people. On the opposite end of the travel experience spectrum is the desire to go back and revisit beloved destinations from childhood trips. 34% of travelers say they would consider a nostalgia-fueled vacation, with the desire to retake a childhood trip being highest among millennials. For some groups of leisure travelers, there is nothing more nostalgic than a road-trip, and this kind of vacation has been consistently popular in recent years. For boomers, nostalgia is a significant motivating factor, while millennials seem to be more motivated by the affordability of a classic American road trip. While it is assumed that people travel during the winter to get away from the cold, there are many other reasons for a winter getaway. While 79% of Americans say they would consider an overseas trip during the winter, less than half would be seeking a change in weather. One reason for this is because some of the most memorable travel experiences are only available during the winter, like getting a good view of the northern lights. Travelers are also considering this kind of trip because it is a change from the typical kind of vacation. While relaxation is still important to many travelers, cultural and unique experiences are being prioritized. The desire to fit as many memorable experiences as possible into a trip seems to be part of a larger trend. American leisure travelers want to make the most of their vacation time, largely because they do not get many opportunities for leisure travel. In fact, 52% of Americans had unused vacation days by the end of 2017. There are many reasons for this, including the fact that most workers feel they would look replaceable if they took too much time away from the office, and don’t want to return home to a mountain of work. Americans also have not traveled in their own country as much as they would like, as 86% say they have not seen enough of the United States. However, the trend of Americans taking fewer and fewer vacation days could be reversing. After a gradual decline in average vacation days used between 1998 and 2014, the national average has been on the upswing for the past three years. The change between 2016 and 2017 was small, with the percentage of employees with unused vacation days shrinking from 54% to 52%. Even still, Project Time Off reports that the increase in vacation usage had a $30.7 billion impact on the economy. If this turns into a larger trend, popular tourist destinations across the U.S and around the world will have a greater opportunity for growth. Even though Americans are having trouble booking off time for vacation, there is still some desire for last-minute trips. This is amplified when the hotel or flight is discounted, with 60% of travelers saying they would consider taking time out of their busy schedules to go on a spontaneous vacation, as long as the price was right. Americans are particularly willing to use their smartphones to book last-minute vacations, as 72% of all mobile bookings happen within two days of the trip. The U.S. leisure travel industry is a juggernaut in the international market, but recently it has not seen the same levels of growth as other major countries. While U.S. tourism is performing better than it was at the same time last year, their annual growth of 2.3% in 2017 does not measure up to Canada, China, Spain and the United Kingdom, which all grew by at least 5.5.%. This may not be a reason to panic since a strong U.S. dollar could be a barrier to travelers from countries with weaker national currencies. There is also still significant interest among travelers around the world to visit the United States, and Americans themselves have a large appetite for travel. While external factors may complicate matters going forward, the desire to discover what the United States has to offer is strong, keeping the country a major player in the global travel industry.